Tennessee football coach Butch Jones speaks to media at the Big Orange Caravan's stop in Chattanooga on June 3. His Vols begin preseason practice today in Knoxville. 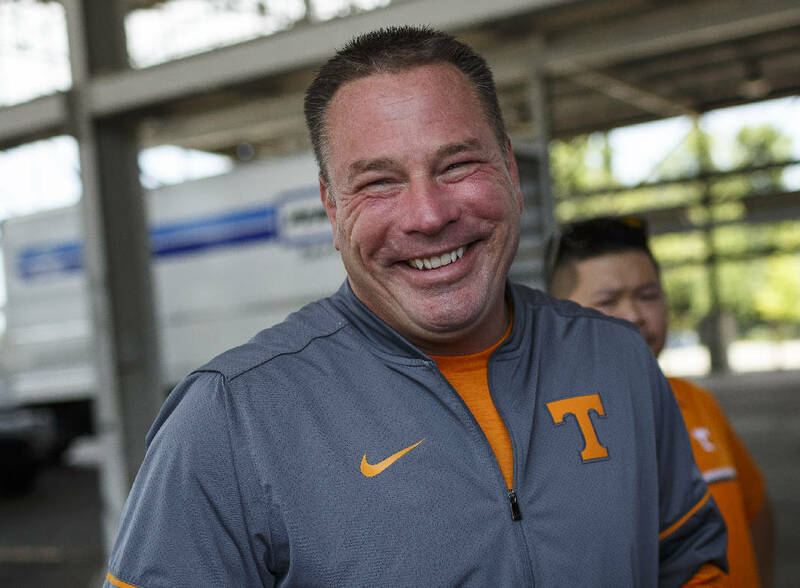 KNOXVILLE — A grin spread across Butch Jones' face as he prepared to answer a question about how Tennessee's football coaches will handle the competition for playing time on the offensive line during preseason practice. "Got to love it, don't you?" Jones said. "Competitiveness brings out the best in individuals. That group, along with all our position groups, they've done a good job of embracing the competitive spirit." Tennessee's fifth preseason camp under Jones begins today, ratcheting to full tilt a series of position battles such as those on the offensive line. With clear opportunities for playing time at quarterback, backup running back, wide receiver, offensive line, linebacker and in the secondary, Jones said this camp should be the most competitive of any the Volunteers have been through during his coaching tenure. Jones' optimism about the effects of the roster-wide competition was evident as he met with reporters for nearly 30 minutes Friday to preview the upcoming weeks of preseason practice that begin with today's 3 p.m. workout at Haslam Field. "As you all know, the greatest motivator is playing time," he said. Even the spot of senior kicker Aaron Medley, a three-year starter, will be subject to competition as the Vols work toward their Sept. 4 opener against Georgia Tech in Atlanta. Unlike in years past, there are few established stars on this Tennessee roster. Instead, there is a deep well of players with talent at most positions. The evaluations begin in earnest as the Vols hit the practice field four of the next five days with players allowed to wear helmets. The pads will come on Aug. 5. Jones said all except four players on the roster are entering preseason camp as full participants. Junior offensive tackle Chance Hall will be limited as he works through a knee issue, and linebackers Daniel Bituli and Darrin Kirkland Jr. will be "very limited" as camp begins. Junior defensive tackle Shy Tuttle is expected to participate in individual drills, but Jones said UT's coaches will be careful to ensure they do not overload Tuttle as he continues his return from a knee injury. The position battle likely to generate the most interest will be the duel between Quinten Dormady and Jarrett Guarantano for the right to replace Joshua Dobbs at quarterback. Jones permitted Tennessee's skill players to organize 7-on-7 drills over the summer so the quarterbacks could begin developing chemistry with a young group of receivers. The results of that work will be on display right away in practice. "It'll be the first time tomorrow that I'm able to see the timing, rhythm and spacing of our throw game," Jones said. "When I said I'm excited to take the offseason to the practice field, that's one of the elements I'm looking forward to seeing is those small details in the throw game." Another immediately noticeable development is expected to be the results of new strength and conditioning coach Rock Gullickson's offseason training program. There are 21 players on the roster who can power-clean 300 pounds or more and 10 players who have squatted 500 pounds or more, Jones said. Both are records for the Jones era. "Significant progress during the summer months from a strength standpoint, from a power standpoint, a muscular size standpoint, but also from a confidence standpoint as well," Jones said.